After clearing immigration, we followed the signs (in English) to the Haruka Express train. I had read a fair amount about taking the train from Kansai Airport to Kyoto but the ticket situation was somewhat baffling. We didn't need a JR pass and while there were discount options, I couldn't figure out how to purchase a discounted green car (first class) ticket in advance. 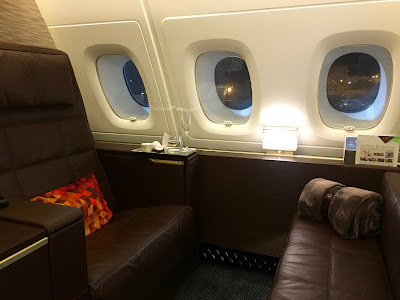 We certainly didn't need the first class experience but figured it would be worth reviewing. We made it to the train station and headed to one of the green automated ticket kiosks. I've had a fair amount of experience purchasing train tickets in other countries but this was a whole new level. I finally managed to figure it out with a lot of help from Emily and a return from the station entrance gate to the ticket kiosk to get another ticket. You need the ticket as well as the "express" surcharge ticket. I should note that you need a chip and PIN card to make a purchase at the kiosk. I was able to use my Barclays Arrival card with no issues - it's the only chip and PIN (that I know of) enabled card in my fairly large portfolio. I imagine you could make a purchase with cash or a credit card at the staffed ticket counter but that would certainly take a bit more time and be less fun.